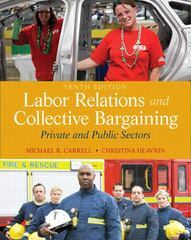 Labor Relations and Collective Bargaining 10 Edition Bring your best case to the table by putting theory into practice with this guide to labor relations, unions, and collective bargaining. Labor Relations and Collective Bargaining: Cases, Practice, and Law introduces readers to collective bargaining and labor relations. This text is concerned with application, as well as coverage of labor history, laws, and practices.